This project started with a lot trust and a simple, along standing fountain in my parent’s backyard painted 12-13 years ago. 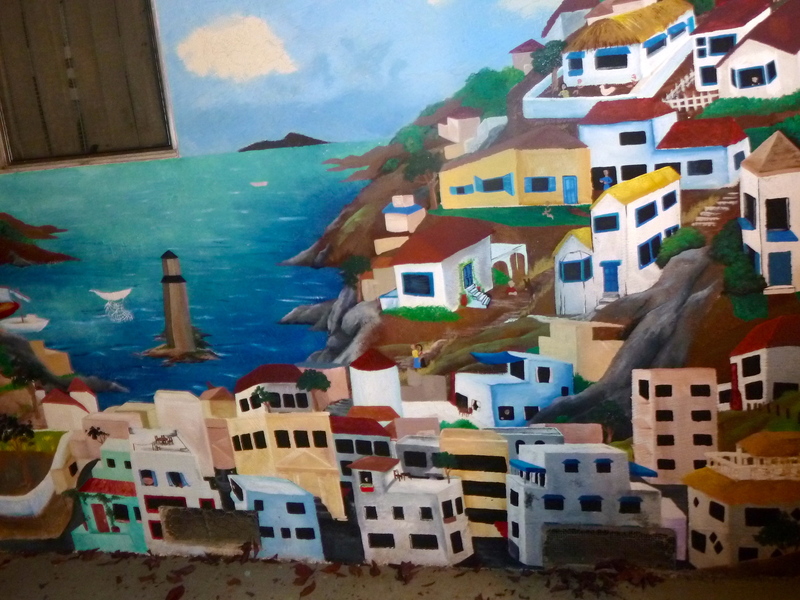 It was my second mural ever. It tricks the eye and brings a little bit of the villages of Greece to this bustling Silicon Valley backyard. 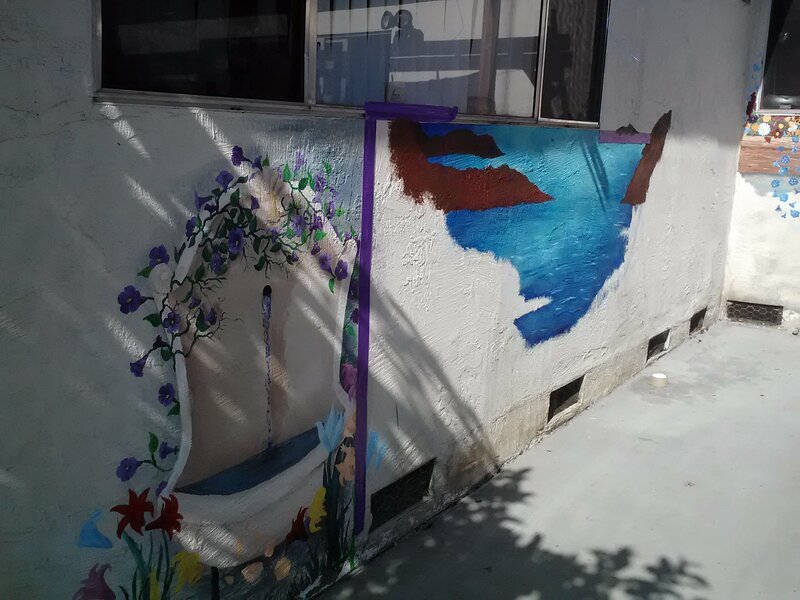 I surprised myself, for the first time painting on stucco – the thing I do now almost exclusively. This was inspired by a song we sang in Greek folk dance and later painted for a theater backdrop. This huge extension started with the addition of an over pouring flower box. This little murals was awesome Mother’s Day gift that creates an optical illusion, but it looked odd sitting there on its own. Actually, the flower box and fountain both did. So I decided to bring them together in my free time. From there, I was trying to formulate a perfect scene that would united a homey flower box and a traditional, Greek fountain. There aren’t very many options that fit. My parents had always talked about but have never been to Greece, where my father’s family is from. I decided to lay down a coastal Greek Village between them. This will create the feeling of wide open space, and another illusion of the corner in the house. When I was sixteen, I went to Greece. 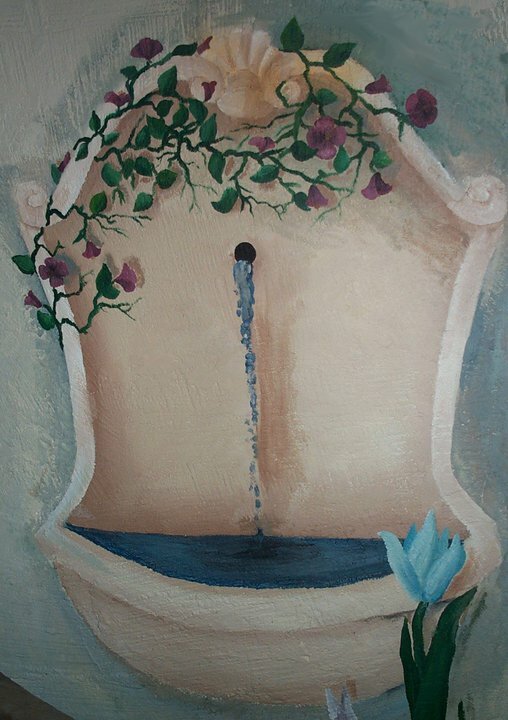 Then, painted the original fountain with the unique knowledge I had. Relying on this and the trusty internet, I was sure I could create something fantastic for them that feel whole and complete. First, I restored the brightness and color of the flowers at the original fountain. The rest of it held up pretty well over 10 years later. I surrounded the fountain with new flowers to match the neighboring, living flowerbed, hopefully blurring that illusion. . I taped the fountain off to create a foreground level of depth. I also taped off the corner before proceeding with the background, creating the next optical illusion. Then it was time to sink my teeth into a huge undertaking of background. I started with the fun part, the sea. I know my coastal regions of Greece are often hill, sometimes mountainous and so I did steep, interesting hillsides. My mom loves the mountains. I wanted to give them a killer view. I also added a pier, because if there’s people living in a village, there’s a little industry and there’s fishing. Greece isn’t super green and lush, but it has it’s far away windmills, trees and houses. Then, I began adding houses, vineyards, boats, goats, churches, and walkways. I don’t think this hilly place is easy to drive around. I think it’s neat to have a throwback village. It’s unique like they are. Hopefully it brings them back to a simpler time and helps them relax. I decided to have a bustling city down below, this foreground being up on a hillside itself away from the action. I added a lighthouse, because I obviously have a bay going on and it would be dangerous to sail here at night. The houses came in at different times, in different colors and really come together towards the end with the details. Right now, it’s time to straighten these things out. 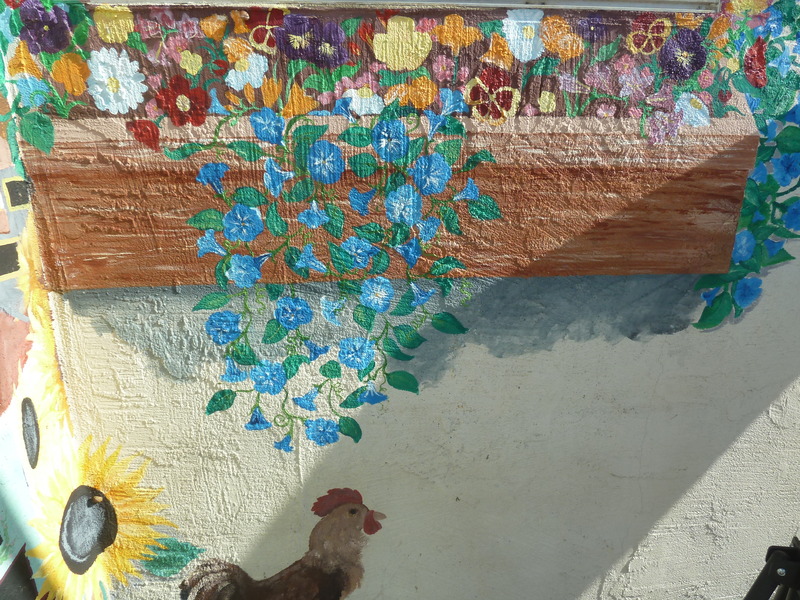 I’ve added flowers and rooster to the foreground. Because it felt a little abrupt in its definition. I added sunflowers to draw the eye up and down and make the whole scene feel taller and ultimately more open. I’ve added people, a school, clothes lines, tables, etc. All the little things that give a city personality. Adding detail at this point is only going to capture the optical illusion further. Nowadays, it looks like this. I’m adding colorful bougainvillea to the foreground and finishing details on faces and houses. Then, I get to seal it and call it complete. Because I’ve had the opportunity to work on it over time, it’s taken a long while but it is a delight for the eyes. Time well spent. Marketplaces, water well, Orthodox priest, woman rocking babies, schoolyard with children, etc.